Plass: THIS WORD teaches that churches should grow together from within and should not be tied together from without, the Doctor contends in his sermon of October 20, 1532, on the armor and weapons of the Christians, with Ephesians 6:10-17 as his text. The blessing [of the Word] is so great that no human heart can comprehend it. This is why its retention requires a stout, stiff battle. Even then it is easy to lose it forever if we do not hold to the Word with all our might. By no means is the Word to be considered as lightly as the world considers it, and as some foolish spirits, deceived by the devil in regard to the Sacrament or other heresies, represent it to be. They tell us that one is not to quarrel so violently over one article and disrupt Christian love because of it. But, they say, one might well yield and surrender a bit and keep up fraternal and Christian unity and fellowship with those who err in an unimportant point -- as long as one agrees with them otherwise. No, my good man, for me none of that peace and unity one gains by the loss of God's Word! For in that case eternal life and everything else would already be lost. In this matter we dare not budge or concede anything to please you or any man; but all things must yield to the Word, be they friendly or hostile. For the Word is given not in order to achieve external or secular unity and peace but life eternal. Word and doctrine are to create unity or fellowship. Where they are one and the same, the rest will naturally follow; if not, no unity will abide anyway. Therefore do not speak to me of love or friendship when anything is to be detracted from the Word of the faith; for we are told that not love but the Word brings eternal life, God's grace, and all heavenly treasures. We will gladly keep the peace with them in an external way, as we should do with everybody in the world, even with our worst enemies ... but in doctrine and Christian fellowship we want to have nothing to do with them. Nor do we want to consider them brethren. They are enemies, because they knowingly insist on their error; and we intend to fight against them in our spiritual struggle. Therefore nothing but a satanic, seductive, and sinister strategy is involved when we are called upon to yield a bit and to connive at an error for the sake of unity. In this way the devil is trying cunningly to lead us away from the Word. For if we adopt this course and get together in this matter, he has already gained ground; and if we were to yield him a fingerbreadth, he would soon have an ell. In a Lutheran Layman's terms, forget about figuring out what a fox says! 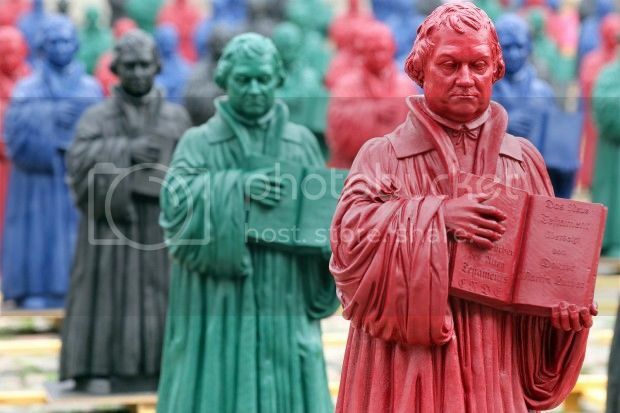 Spend some time figuring out what Martin Luther said about various topics, because he will always point you to Jesus Christ, the Word of God, and the Lord's Sacraments.